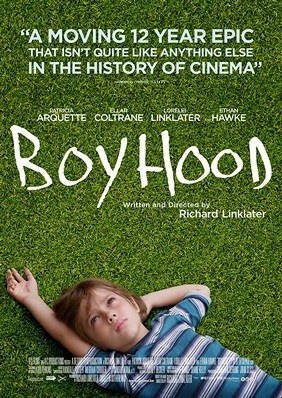 Tag line: "12 years in the making"
Richard Linklater’s Boyhood was, as its tagline boasts, a movie 12 years in the making. Shot periodically between 2002 and 2013, it follows Mason Jr. (Ellar Coltrane) as he grows from a boy into a young adult (Coltrane was seven when production started and 19 when it finally wrapped). It was a bold experiment, to be sure, but then Linklater was no stranger to following characters over an extended period; Before Sunrise, Before Sunset, and Before Midnight, all of which were shot seven years apart from one another, track the blossoming romance of two lovers over 14 years. And much like he did with that trilogy, the director brings a sense of realism to Boyhood that only time could achieve. When he was seven, Mason Jr.’s mom Olivia (Patricia Arquette) moved both he and his older sister Samantha (Lorelai Linklater) to Houston, where, hoping to make a better life for her young family, she enrolled in college. Things take an unexpected turn, however, when the children’s father, Mason Sr. (Ethan Hawke), who had been out of the picture since he and their mother divorced, returns from Alaska, announcing that he intends to stick around Texas for the foreseeable future. Once in school, Olivia starts dating her psychology professor, Bill Welbrock (Marco Peralla), who has two children of his own (Jamie Howard and Andrew Villarreal) from a previous marriage. Olivia and Bill eventually marry, and are happy for a while, but Bill’s drinking soon spirals out of control, causing Olivia to file for divorce. Several years later, Olivia, now a teacher, moves in with Jim (Brad Hawkins), an Iraqi war veteran, while Mason Sr. marries Annie (Jenni Tooley), with whom he has a new baby. As for Mason Jr, who’s become quite a talented photographer, he meets and falls in love with Sheena (Zoe Graham), a high school classmate, and the two talk of attending the same college in the spring. But as graduation day approaches, Mason Jr. discovers that even the best-laid plans can quickly fall apart. Linklater does occasionally throw a few cultural references into Boyhood to remind us of the period in which each segment takes place. In one of the film’s opening scenes, Samantha annoys Mason Jr. by belting out the Britney Spears song “Oops I Did it Again”, and later on, after Olivia and Bill have tied the knot, the kids dress up in Harry Potter costumes and head to the bookstore for the midnight release of Harry Potter and the Half-Blood Prince (which hit shelves in July of 2005). The film also has its share of tense moments, like when Olivia decides to leave Bill, whose become abusive towards her and Mason Jr. Ultimately, though, Boyhood isn’t as concerned with high drama or the changes in society as it is the way its characters relate to one another over time. This is best exemplified in the weekend getaways the children have with their real father, Mason Sr. Early on, he takes Samantha and Mason Jr. bowling, and to Minute Maid Park to see a Houston Astros baseball game, but a few years later he and the kids are putting up “Obama / Biden” signs in a suburban neighborhood and discussing the importance of contraception (a topic that comes up when Sam announces she has a new boyfriend). Over the course of the film, Mason Sr.’s relationship with his children evolves, going from a fun-loving dad to a concerned father who wants to ensure that his kids remain on the right path (a conversation he has with Mason Jr. about the nature of high school romances is especially poignant). Much like he did in Linklater’s Before trilogy, Ethan Hawke comes across as completely natural in these scenes, and as a result, the talks he has with the kids feel 100% genuine. Addressing the process of growing up like no movie has before it, Boyhood is an epic cinematic achievement that, at the same time, is an intimate look at families and the ties that bind them. It is, simply put, a remarkable motion picture experience.